Air Science provides a variety of fume hood services to our clients worldwide. Our international reach allows us to support you during the purchasing process and ensure your equipment maintains performance reliability for years to come. Our staff has over 50 years of combined experience in the industry. We ensure all Air Science products are installed in accordance with product specifications and that all filters are appropriate for the intended application. During installation, Air Science works with the facility lab safety officer or engineer to ensure the necessary standards and regulations for your industry and any compliance or local codes are followed. Fume hoods and BSCs typically require annual testing and maintenance, per ASHRAE and NSF/ANSI standards respectively, though more frequent intervals may be required by your governing industry standards or laboratory procedures. Regular preventive maintenance of your ductless fume hoods is essential for the continued safety of your personnel and your work. Routine maintenance and testing services also help prevent unplanned downtime. Air Science provides maintenance services for all product lines. Our expert technicians provide basic maintenance services to routinely check alarms, sashes, ports, fans and other system components. Maintenance services can be tailored based on your specific application and standards requirements. We also provide equipment inspection services. Air Science provides high-quality activated carbon filters, HEPA/ULPA filters, and other consumables through Filtco Filters. 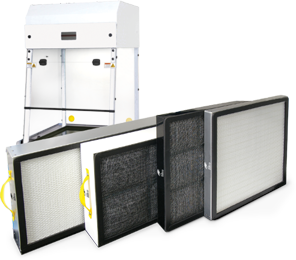 Filtco Filters work with all Air Science products as well as ductless fume hoods from other major manufacturers. Regular filter replacement is critical for continued safety. You can reorder filters easily and create a filter replacement reminder to fit your schedule. When purchasing ductless fume hoods or similar equipment from Air Science, we provide filter selection services to help you choose the best existing filter for your application or develop a custom solution. Air Science uses form SEFA 9-A, a standardized test developed by the Scientific Equipment and Furniture Association (SEFA) to determine suitability of ductless technology for the intended application. Filtco Filters provides turnkey safety management services for customers. The Filtco Safety Management (FSM™) program assists with specification, installation, and inspection for ductless equipment and ductless filters. Air Science’s Secur™ Safe Disposal Service provides environmentally friendly disposal of saturated filters. Available in select markets, Secur can be added as a separate line item in your annual service quote or bundled with your replacement filter costs. Want to learn when our Secur Safe Filter Disposal Service is available in your area? Join our list and receive notification when Secur is available near you.